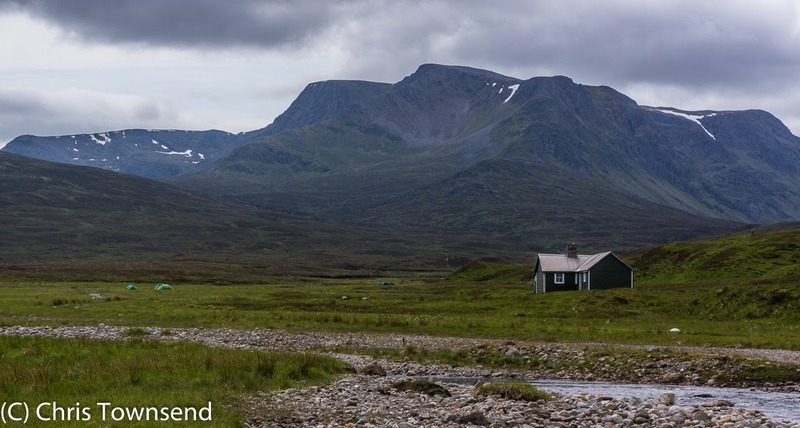 Following the sad news that the excellent Culra Bothy in the Ben Alder region, where I have stayed several times, has been closed* here is a piece in praise of bothies that first appeared in The Great Outdoors a few years ago. *Due to asbestos sheeting in the construction. The bothy will probably be pulled down and may be replaced. See news report from the Mountain Bothies Association. I love sleeping under the stars with nothing between me and the universe. A roof cuts you off from the world. However in the UK the weather too often makes sleeping out rather uncomfortable so a tarp or tent is usually a necessity. And on those trips where the rain beats down day after day and the wind thrashes your tent every night lying in a cramped and increasingly damp piece of nylon can eventually become unattractive too. That’s when bothies come in. These simple unlocked shelters have two big advantages over a tent in stormy weather. Firstly they don’t shake noisily in the wind and flick condensation at you. Secondly they have space in which you can stand and move around without having to don all your clothes and venture out into the wind and rain. Bothies only have basic facilities, sometimes being no more than one room with a wooden floor. Many have several rooms though plus wooden sleeping platforms, old chairs and tables and a fireplace or stove. There often isn’t any fallen wood nearby however so fuel may need to be carried in if you want a fire. My first introduction to bothies was during a Pennine Way walk one April long ago. Coming off Cross Fell in dense wet mist I found little Greg’s Hut and spent a warm night there after drying out damp gear in front of a fire. Since then I have spent many nights in bothies and have grown to love the individual quirks and designs of the many different buildings that have been pressed into service as shelters for outdoors people. Bothies are particularly welcome on winter trips, especially when the weather is stormy, as spending long hours cooped up in a small tent can become wearisome. I was reminded of this one February when I hiked the Southern Upland Way, a 13 day trip on which the weather was mostly wet and windy. My second day was spent in wind, rain and low cloud and by the time I reached the little wooden Beehive bothy amongst the dripping trees in Galloway Forest Park I was very glad of its shelter as I had a damp tent from the night before and the wet mist meant that any camp would be very soggy indeed. The next day the weather was worse, starting out with drizzle and finishing with several hours of heavy rain. And throughout I was in thick damp mist. Rather than camp I decided to press on to the next bothy, White Laggan, which I reached long after dark, having been out for 11 hours during which I sloshed some 42 kilometres. The bothy had a good store of wood and a stove so I was soon sitting in the warm cooking my late supper feeling amazingly relieved just to be there. The next morning I stuck my head outside just as the first light was creeping over the land. 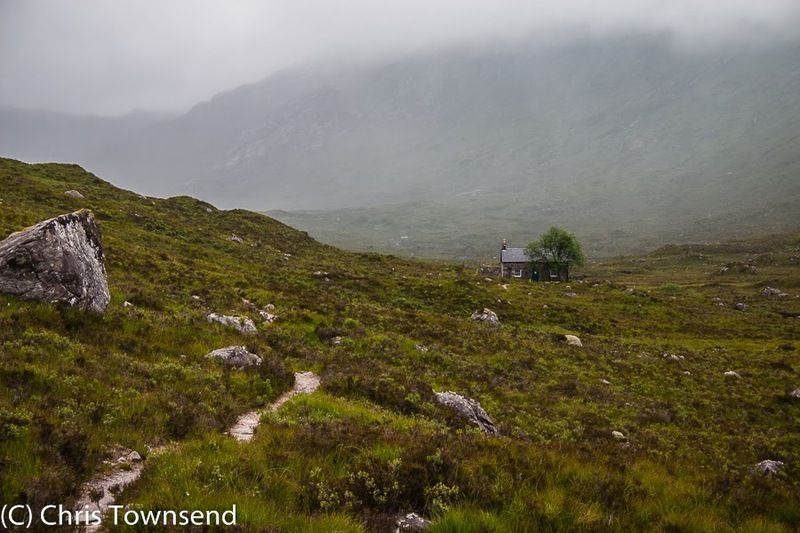 My journal entry tells the story – “mist blasting past the bothy in wet waves. Very windy. No visibility”. I was glad I hadn’t spent the night in my damp tent. Bothies are also a place to meet other outdoors people and share experiences. 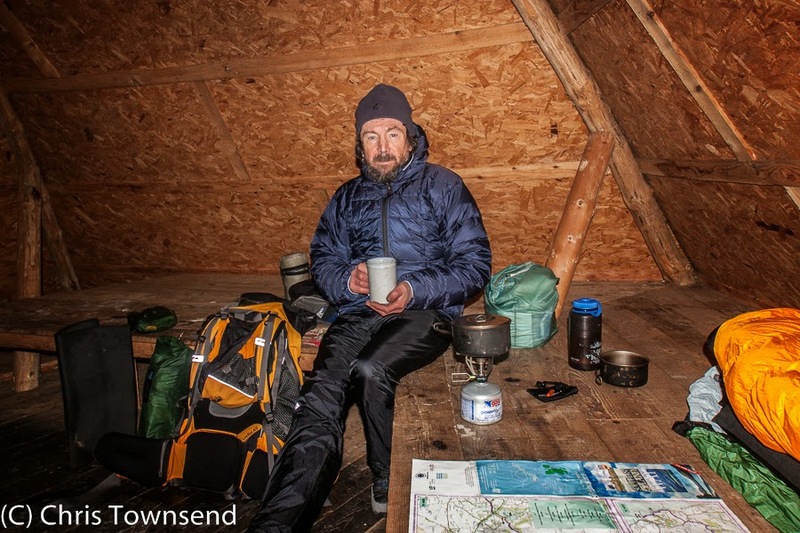 I have had many interesting conversations with walkers and climbers over a hot brew and a bothy fire. Of course sometimes bothies can be crowded – after an experience many years ago when fifteen of us crammed into little Corrour bothy in the Cairngorms, which was really only big enough for half that number, I have always carried a tent or tarp and been prepared to camp out if a bothy is full. The only exception was when I planned a TGO Challenge Route using bothies plus a few B&Bs the whole way across, including one high level rickety wooden hut that was blown down by the wind a few years later. On this trip I found another disadvantage of not carrying a tent – you have to reach the bothy regardless of conditions. Overall it was a difficult crossing – the hardest of the 14 Challenges I have done. There was still deep snow on the hills and the weather was windy and frosty. An ice axe was essential and our route was changed a few times to deal with the conditions (we were blown back from an attempt on Ben Nevis). On reaching the Cairngorms we stayed in Ruigh Aiteachain bothy in Glen Feshie before crossing the Moine Mhor to Corrour bothy. The going was hard work due to the deep soft snow and it was late when we arrived on the rim of Coire Odhar high above the bothy. However the snow on the steep upper slopes of the corrie was hard and icy and, having no crampons, we had to cut steps with our ice axes, slowly zigzagging back and forth across the slope until we reached easier ground. All the time we could see tents outside the bothy so we had the added worry that it might be full. In fact to our great relief it was empty. If we’d had tents we’d have camped on the tops or found an easier way down. Bothies require maintenance if they are to remain safe and watertight of course. A wonderful volunteer organisation, the Mountain Bothies Association, does the work and deserves the support of everyone who ever uses a bothy. I joined it after my stay in Greg’s Hut and have been a member ever since. The MBA has an excellent website where the Bothy Code – sensible guidelines for using bothies – can be found. I love bothies - more so than camping - always interesting to find out who you will meet at the end of a day in the hills. The image at the top of the page is stunning, the bothy looks so isolated and after a hard days walk so inviting. Do you have any idea if it will be replaced or what is the decision making timescale? There's been no announcement on a timescale yet, just a statement that it might be replaced. That will be up to the owners of the estate of course. First the current bothy has to be removed.